We are located at 160 Alfred Road, West Kennebunk, Maine. Worship is at 8:30 am every Sunday. 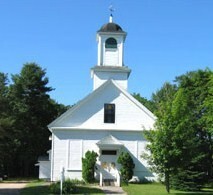 Sunday school meets from September through half of June and is open to all children. The children come to worship and leave to go to their classes after the children's message. We are a small, growing congregation with an active Sunday School, Ladies' circle, and Youth Group (grades 8-12). We plan to begin a junior youth group for grades 5-7 - in process! the first Saturday in October.